Peschiera is one of the locations around the shores of Lake Garda where archaeologists have discovered prehistoric stilt houses from the Bronze Age (part of a UNESCO World Heritage listing). Its strategic position on the lake shore and at the mouth of the Mincio led to it becoming an important strongpoint for the Romans, who called their settlement Arilica. 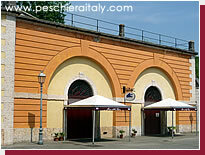 From Peschiera it was possible to navigate all the way through to the Adriatic Sea using the Mincio and the Po. In the Middle Ages, the town came under the control of the important Scaliger family from nearby Verona before it fell to the rival Visconti family from Milan and, eventually, into the hands of the Venetian Empire. The small museum is located just inside the arch of the Verona Gate to the Peschiera fortress (on the eastern side in the direction of Lazise). It is a voluntary operation tucked away in the grounds of the old artillery barracks and is only open on the weekends from 10.00 to 12.30 and 16.00 to 18.30. Entry is free and gives an idea of what life was like in the principal historic occupation of this area - with exhibits of some of the traditional fishing and hunting boats used on the lake, as well as tools used in the fishing and fish farming which was one of the main occupations here from the Middle Ages onwards. All of these rulers contributed to the growing fortifications and militarisation of the town. By the time of Napoleon, the Venetians had contructed a massive structure surrounded by water in the middle of the river. The large 'gate' on the eastern side, the Porta Verona, originally displayed the Lion of St Mark, the symbol of Venice. The area fell to the French but, with the eventual defeat of Napoleon, it was granted to the Austrians, who made the fortifications part of what was known as the Quadrilateral. These were four massive fortresses built at Peschiera, Verona, Mantua and Legnano and designed to protect the area and the communications around the Mincio, Po and Adige rivers against the Italian independence movement. One of the main attractions for families staying on the eastern shore of Lake Garda - especially German-speaking families - is the Gardaland complex of amusements and rides. 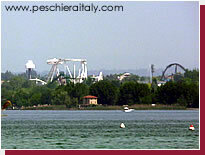 Gardaland is situated between Lazise and Garda and its visitor numbers approach 3 million people a year. It is not the only funfair complex on Lake Garda - the rival Movieland park and Canevaworld acqua park are also located nearby - and this (as well as the generally fine weather) helps account for the number of family campsites in the Peschiera area. There is a regular bus service between Peschiera and Lazise - car drivers should note that the single coastal road often gets very busy in high season. 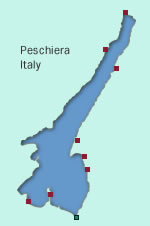 Peschiera eventually fell to the Piedmontese forces in 1848 after a siege of around 40 days. It became part of the new Italian republic in 1866 with the Treaty of Prague. Most of the fortifications which can be seen today originally date from the 16th century. It is now possible to walk along a number of the fortress walls, with lovely views onto the canals, the Mincio or Lake Garda and the former military strongpoint is becoming more 'tourist-friendly' as the years pass. This historic town in the Mincio valley is around 13km south of Peschiera and makes an interesting day trip by car or public transport (there is also a bike route along the river for the more energetic). Its main attraction is the former fishing hamlet of Borghetto on the river with its alleys, millwheels and wooden bridge. This was once a fortified dam and the remnants of the towers can be seen at either end of the iron bridge which now crosses the river a little bit downstream from the village. These were once connected to the 14th century Scaliger castle on the hilltop. The main town is also famous for its handmade stuffed tortellini and there are a number of shops selling these local delicacies.Those interested in ornamental parks may like to make a stop at the Sigurta Gardens just outside Valeggio.